To summarize: In early 2011, a handful of new outlets reported that the constellations had shifted from when the zodiac was first derived 3,000 years ago and so everyone’s sign was “off” by about a month. Additionally, they reported the story that there now are 13 astrological signs, not 12. The implication was that the astrological sign you were born under may not be the sign you’ve always been told it was. Astrologers and journalists reported back that they knew this all along. According to these folks, people’s signs had not changed, and Ophiuchus was not a new sign. 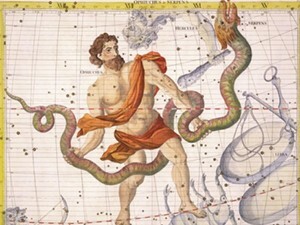 Yes, the constellations have changed and Ophiuchus is a constellation that the sun passes through but, in short, nothing about astrology and the zodiac had changed. What I want to explore in this post is how well journalists and astrologers explained the significance of the issue. Did they help raise the profile of astrology and astrologers? Or, did the coverage end up detracting from astrology? It turns out that most journalists, rightly so, took their cues from everyday folks. The predominant storyline, most prominently told in blog comments and youtube videos, was: “I’m having an astrological identity crisis.” And journalists were there to cover that story. There was an enormous amount of humor but also anger and angst that permeated social media; I particularly like the complaints of Outback Zack, Georgia, and Miss Dills, all of whom refused to give up their sign, and then there is the irate, young woman on Ally Dreams Tea who calls the whole issue a conspiracy theory drummed up to help astrologers make money. The outpouring of angst surprised me, although I wasn’t happy about what I considered a demotion, from airy Gemini to plodding Taurus. I had thought astrology was a relic of my own youth, like lava lamps and mood rings, and not something people paid much heed in this post-Aquarian age. But clearly people are very attached to their sun sign—they consider it a part of their identity, like their hometown, their fan allegiance or even their ethnic background. They don’t want the cosmos to yank their self-concept out from under them. Their reactions didn’t focus on astrology as a way to navigate through life. No one was bemoaning decisions based on a daily reading that now seemed less valid. Astrologers are fighting back with counter-PR, saying they knew about this moon-pulling business all along. They say it’s irrelevant, because Westerners follow the “tropical zodiac,” as opposed to the “sidereal zodiac,” and something about the constellations and the vernal equinox. We “rational” astrology followers can’t be bothered with the details; it’s not like we really believe in this stuff, except for when we do, and at any rate, it’s Greek to us. Still, the swift debunking came as a relief. First, the positives. There were many journalists that really were quite balanced, taking up the technical and scientific issues in hundreds of articles and stories that covered unsexy topics like precession and the historical origin of the zodiac. They seemed to get the idea that there are two different zodiacs, even if they did not entirely understand why both of them “work.” Reporters also seemed sympathetic to the astrologers’ viewpoint that they were trying to be discredited. Although some of the angst was not helpful, astrologers were given ample space to remind their audience that this was not “news” and that astronomy only had emerged over the centuries from astrologers’ insights. As one astrologer said, “This is an attempt to show ignorance on the part of the astrologers.” Astrologer Maxine Taylor on CNN shrugs it off, saying that there are actually two zodiacs and that this is a straw-man argument meant to debunk astrology. The reporter seems to accept this position. One for astrology! [According to astrologers], the signs have nothing to do with the constellations of the same names. Instead, the signs measure the change in the seasons, starting with the first day of spring. They say it’s just a regrettable, confusing anomaly that our signs are still named for constellations that no longer are astronomically connected to our birth dates. When questioned, however, the astrologers were unable to explain satisfactorily why something as seemingly vital as the location of the constellations in the sky has nothing to do with fortune telling based on the heavens. She [Susan Miller] turned vague and changed the subject when I pressed her to say why a Scorpio born in one year would supposedly have traits similar to those of one born two decades later—given that the planets would have moved to completely different places by then. “We haven’t figured out why it works,” Miller said. Susan Miller is probably faring, in part, from some bad editing! In one CNN interview she rightly suggests that Ophiuchus and precession are not new concepts, and that there is consensus in the astrological community that the zodiac that the Babylonians discovered and that has been perfected since that time is the one that works. (But isn’t the implication, then, that sidereal astrology or that practiced by Indian astrologers “just doesn’t work”?) She makes a similar case on Good Morning America. Unfortunately, Susan Miller does not come off as well during a CNN story that should provide her ample opportunity to talk affirmatively about the benefits of Western astrology. At two intervals, she says “I could get technical” and then proceeds to do exactly that! She also says that planets give people their personalities, not signs, and other things that I find unhelpful and confusing. Unfortunately, she is not helped along by the interviewer who also doesn’t seem to understand any of the explanations, and keeps asking over and over again to cut-to-the chase: Has her sign changed? I guess that’s all we really wanted to know. In the end, I think that journalists did a pretty admirable job in their coverage although they bordered on schmaltzy at times. It seems to me that astrologers should use media moments like this one to more forcefully demonstrate a solid vision about how astrology works and not get into all the details of the “back story” about the various techniques. It’s not a debate and media is a huge opportunity to be persuaded that astrologers have a reliable method that they can deploy. Remember folks, telling people more “facts” never helped anyone win an argument. Recently as I was poring over old public opinion research on American’s views on astrology, I surfaced a survey that blew my mind. A 1998 Gallup Poll took advantage of the media interest in astrology after it was revealed that Nancy Reagan had a personal astrologer. The survey asked a number of questions about how Nancy Reagan’s purported interest in astrology had shifted people’s views on astrology, government, and the Reagan presidency. Of course, it’s impossible to know whether to take Quigley at her word in terms of her influence on Nancy Reagan and the President, but you have to assume that some of her advice was followed. Recently, Nancy Reagan’s interest in astrology has been in the news. What are your own views on astrology? Do you personally believe in it, or not? Has your opinion (of Ronald Reagan) become more favorable or less favorable as a result (of reports about astrology in the White House)? Have the reports about astrology in the White House had much of an effect on your overall opinion of Ronald Reagan, or not? Interestingly, when asked in conjunction with this prompt about Nancy, only 12% of respondents said that they believe in astrology. Perhaps a concrete example makes the larger group of Americans who purport to believe (25-30%) in astrology to rethink their response. Only 1% of respondents said that Nancy Reagan’s interest in astrology improved their favorable view of the President, while 17% said it made them view him less favorably. Finally, 19% said that it had made them think differently about Ronald Reagan and his presidency. It seems like most Americans consult astrology or are familiar with it, and “believe” in it in the most general ways. But when asked to apply it to their own lives or to something like government decisions, people’s tendency to believe in it gets diluted. This confirms my suspicion that the 25% of Americans who believe in astrology, don’t entirely know what they are believing in or that belief is somewhat lukewarm. That doesn’t mean that they aren’t susceptible to greater understanding, but it may be the case that people aren’t thinking very hard beyond sun sign astrology and magazine horoscopes to something more sophisticated. 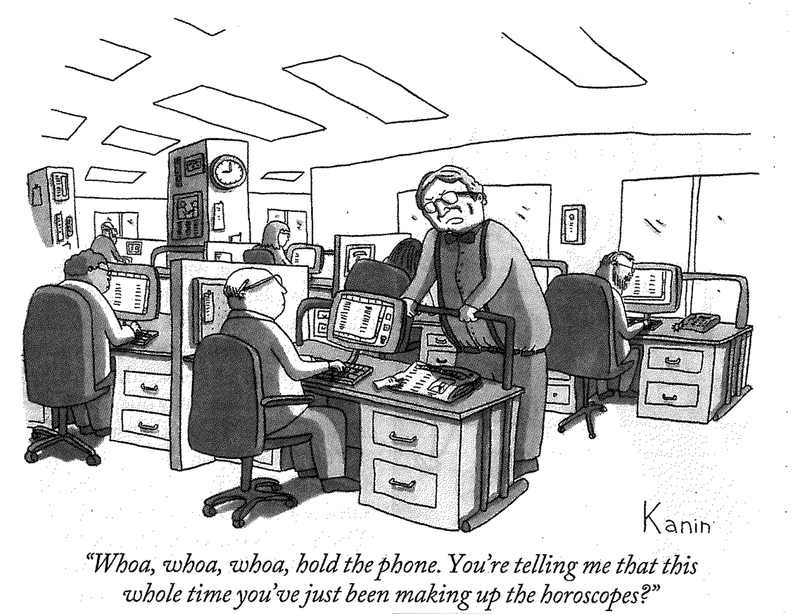 It is rare that I run into someone who doesn’t read his or her horoscope, or at least give a passing glance to it. It may be the company that I am keeping these days, but the statistics say otherwise. It’s actually a fact that millions of Americans regularly consult astrology for insights about their lives. One compelling thing that happened during the big story of 2011 about Ophiuchus going viral is that it reminded me that millions of Americans actually “believe” in astrology and read their horoscopes. Astrology does have a lot of currency with a hell of a lot of folks. Do you believe in astrology, or that the positions of the stars and planets can affect people’s lives? In 2012, Pew sampled more than 3,000 people by phone, and 30% of Americans agreed with this statement. In 2009, 25% agreed. That represents millions of Americans, and these numbers have been verified by polling from other outlets. The Gallup Poll, for example, has been asking a similar question since 1975 with the following results: 25% (2005); 28% (2001); 25% (1996); 23% (1994); 25% (1990); 31% (1978); and 25% (1975). When Fox News asked this same question in 2005, 37% of people said they believe in astrology; a 2003 study by Fox News put this number at 29%. There are a few outliers like a 1998 ABC/Washington Post Poll where 16% believe in astrology, but for the most part the numbers hover in the 25-30% spectrum. For more than 35 years, more than 25% of Americans have said that they believe in astrology. The 2009 Pew study is interesting for a number of reasons, that I will summarize here. You might wonder—who are these 25% of people who believe in astrology? What is their profile? To begin, the Pew study tells us that they skew younger; in fact, the younger a person is, they more likely they are to believe; 18-24 year-olds believe (32%) and 65+ believe to a much lesser degree (18%). They also tend to be less formally educated; in fact, the more formal education people have the less they tend to be believers. Likewise, they tend to be more liberal (30%) than conservative (18%) and to be poorer (32% of those making under $30,000 a year) than wealthier (16% of those making over $75,000 per year). Democrats outnumbered Republicans 2 to 1. There were more believers on the West Coast (29%) versus the South (22%), but there was not huge variation in the four major regions of the country. There were a couple of surprises for me, though. My own suspicion was that the percentage of women who suscribe to astrology would be much higher than men, but it is only modestly so; 28% of women versus 21% of men. A more startling fact was that while 22% of believers were self-identified as Caucasian/White, 29% of African-Americans and 35% of Hispanics claimed to be so. I am fortunate that I work with a number of very talented public opinion researchers, which has given me some modest insight about how all this works. They also have given me so cues on how to identify some of the best research over the last twenty or so years on this topic, which is admittedly scarce. Generally you analyze public opinion not only to get a snapshot about the beliefs of a particular group, but also to change or modify it. From my vantage point, if I were a member of the astrological establishment, I would be using this sizeable audience to identify key opinion leaders and influencers who could help expand the universe of folks that give additional credibility to this art. Although 25% of Americans believe in astrology, more than 50% regularly read their horoscope or a personal astrology report (2010 General Social Survey) either occasionally or regularly. So more than half of Americans are aware of astrology, even if less pay active attention to it. And only 5% actually said that “horoscopes or astrology helped you make decisions about your life” (1988 CBS News/New York Times Poll), so far fewer are either able to make sense of their horoscopes or know how to practically activate themselves around it. All of this opinion research though still begs the question about what people actually believe in. Truthfully, I am not sure what these folks think astrology actually is, and I can’t tell you how many folks ask if being psychic and intuitive is the same thing. These are good questions. So there is a lot of room to actually influence and shift people’s thinking on this topic. Truthfully, I had no idea that there is a sub-field of astrology called meteorological astrology that focuses on the placement of the sun, moon, and planets to forecast the weather. But this should not be an entirely surprising activity. Ancient astrologers, without the benefit of satellites and computer modeling, were patient sky-watchers, believing that aspects between planets were portents of weather. In addition to weather prediction, for thousands of years people have looked to the sky to calculate directions, measure time, know when to plant and reap crops, and plan for important events like marriages. Hurricane Sandy has made me immediately dive in to see if there has been any compelling coverage about this catastrophic event from an astrological perspective. Is weather prediction and astrology passé now? Most people know that there was a full moon the night that the hurricane struck. This is represented in the chart with a moon in Taurus in opposition (180 degrees) to the sun in Scorpio. Obviously, this sun-moon transit is the most obvious one because almost everyone affected by the hurricane knows that the problems were made more acute by the full moon on the Monday night. Joyce Hopewell focuses on the Sun and Saturn conjunction, the Uranus and Pluto square, and the Jupiter and Mars opposition. But in some of these transits, they happen over a long period of time (some for a week and some quite longer) and it’s not obvious to me how the chart can be related specifically to the hurricane actually hitting the coastline because the chart would have looked similar on other days of the week, if not the week prior. There is other coverage, like Dark Astrology and Solaris Astrology that focuses on very obscure stars, and Tara Greene focuses on water themes in the chart. No surprise, much of the brief coverage is focused on the fact—no astrological interpretation needed here—that Hurricane Sandy completely changed the conversation about the Presidential Election. It seems like the two campaigns were at a near stalemate just over a week ago, but how the Obama Administration has dealt with the recovery effort may have helped shape the outcome of the election. Perhaps everything is not about politics anymore! Rather, we have a real referent now—the world we actually live in—as opposed to the stories (and fictions) of both candidates. As Eric Francis says, it’s nice to have a reality check now and not just unbridled politics. As we are deep into election season, I would be remiss to not turn my attention to the upcoming United States presidential race. Fortunately for us all, there was no need to wait until now to do all the speculating since there was a major confab of the world’s leading astrologers—a once in every-four year event—that took place from May 25 – 30, 2012 in New Orleans, the United Astrology Conference (UAC). As one Reuters reporter put it in the Chicago Tribune, there is “no need to wait for November to know the election outcome” although speculation abounds. Here is a brief Associated Press video that showed up on the USA Today online edition. Other major outlets like USA Today, Houston Chronicle, Huffington Post, New York Daily News, and the hometown New Orleans Times-Picayune also covered the event using a similar storyline. Even the blog Christian Post covered it. Major news outlets routinely cover astrological predictions for presidents although I haven’t had time to review the extensive astrological coverage of the historic 2008 election yet. The good news is that there is still a lot of consensus from the astrologers: that Obama is likely to be elected, but that the election will be very close (or maybe even too close to call). Part of the reason why there is consensus: the transits leading up to and on election day, November 6, and on inauguration day, January 20, 2013 are very favorable to Obama and much less so for Romney. In particular, astrologers like the fact that Saturn and other planets will be transiting through Obama’s 10th house of career throughout the fall. 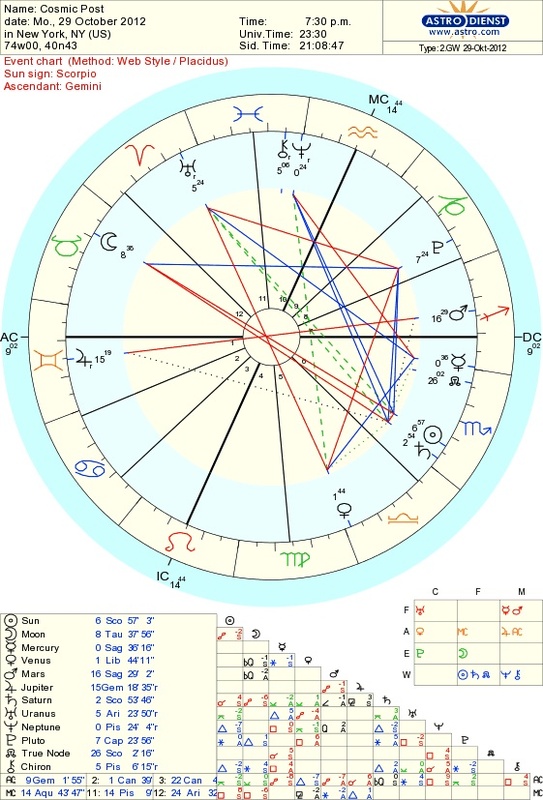 The influence of Saturn and Neptune on Romney’s chart are less favorable. More generically, well-known astrologers like Susan Miller tend to agree, because Obama is a sun in Leo (executive, leader archetype) which is more typical of the pattern of past presidents, while Romney has a sun in Pisces (artist, mystic archetype). According to a PR Newswire article, if Romney had only consulted an astrologer, he would have been more careful and avoided the “verbal gaffe” when he was secretly recorded saying at a fundraiser: “My job is not to worry about those people. I’ll never convince them they should take personal responsibility and care for their lives.” Larry Schwimmer had predicted a predicament like this following the Republican Convention in August 2012. If you want to get all the details, I recommend Larry Schwimmer’s two part series in the Huffington Post, first looking at the Romney-Ryan ticket and then the Obama-Biden ticket. And, Kepler College has produced a great summary of articles on astrological predictions for the 2012 election, highlighting different forecasting techniques. There also is a summary of psychics and tarot readers at Cafe Mom. I found some of the techniques on the more obscure side and designed only for specialists or astrologers who are showing off, but it’s an excellent overview of what it’s all about. And there is other big news about the presidential election, which we probably could have anticipated even prior to Hurricane Sandy. That Mercury will go retrograde the evening of the election. This may mean modest things like problems in the voting booths or misplaced ballots, or something more major like a contested election (Surprise!) 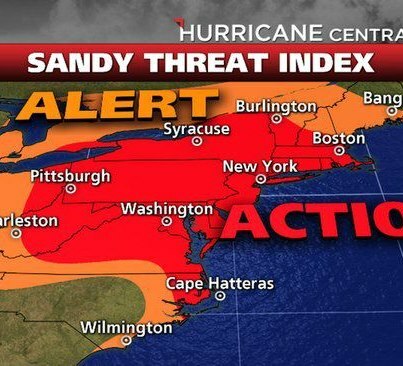 With Sandy in mind, who knows how many folks won’t be able to vote. In November, the planet Mercury (representing communication and thinking) is transiting the sign of Sagittarius, but on November 6, election night, it goes retrograde or backwards. As a result, some astrologers are predicting some element of “chaos” to be determined. Stay tuned! I am coming out about my interest in astrology, psychics, and all cosmic events, to be featured in The Cosmic Post. This blog is fueled entirely by my own passion and curiosity, and not by expertise. I am writing as a student and seeker, and hope you will learn along with me. If you have comments or can offer a correction to any of my views as you read, I welcome your feedback and to become part of the dialogue. Here is the inception chart for The Cosmic Post, launched Monday, October 29 at 7:30pm EST from New York City, right in the middle of Hurricane Sandy as it touches down on the East Coast. I hope over the coming year to aggregate some of the most interesting news and information that emerges in the news cycle, to interview some folks, and recount some of my personal exploration from the field. If you are like me, sometimes I miss a great article or news coverage, or I find out about an exciting new author or event at a late date. If you subscribe or follow my blog, hopefully you will get some exciting links and insights on a regular basis. Welcome!